On 11 – 12 September 2017 Clare Cutler and Natalie Stewart (Doctoral College Research Skills and Development Officers) attended the Vitae Researcher Development International Conference, focused on researcher development policy, impact and application. With over 400 delegates in attendance, the conference celebrated 100 years of the modern PhD in the UK and 50 years of researcher development. With a strong emphasis on the future of researcher development, the growing importance of developing the highest calibre research students, and an increasingly diverse and competitive job market, we came back inspired…inspired to provide a sector leading researcher development programme accessible to all Bournemouth University postgraduate research students. The UK National 3MT® Final was hosted at the conference gala dinner where six finalists from across the UK competed to win a £3k grant to spend on a public engagement activity and a place on the Taylor & Francis Journal Editor Mentoring Programme. This year’s winner was Thomas Fudge from Brunel University. Thomas, who completed his undergraduate degree in Product Design here at BU, stole the prize with the winning presentation on ‘decentralised sanitation for developing communities with energy and nutrient recovery’. You can watch all of the finalist presentations on the Vitae Website here. 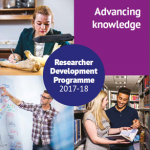 With Researcher Development at the forefront of the research agenda, this year the Doctoral College Researcher Development Programme will be offering over 150 workshops, online modules and video resources specifically for our postgraduate research student’s professional, personal and research development. We have also teamed up with the University of East Anglia, to provide an interactive online training series which is due to launch later this month. In addition to this full and varied programme we will also be launching the Doctoral College’s inaugural 3MT® event. 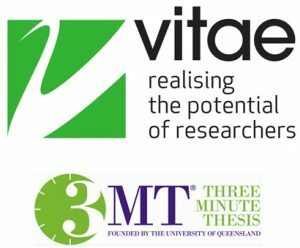 For your place in this national competition and to be in with a chance of presenting your research at the 2018 Vitae Conference 3MT® Final, don’t forget to submit your application by Sunday 22 October 2017 to PGRskillsdevelopment@bournemouth.ac.uk.